CCGTs and small peakers are competing to provide new capacity in the UK power market. A review of embedded generation benefits may determine the outcome. An aggressive government capacity target in the Dec 2016 UK capacity auction is fuelling an intense battle to deliver new power plants. As much as 5GW of new capacity may be required to meet the target. Developers are competing to acquire lucrative 15 year capacity agreements, with indexed annual fixed payments that may exceed 30 £/kW. Rounds one and two of the fight went to the small scale peakers. A multitude of small peaker projects, most of them diesel fired, were successful in the 1st and 2nd UK capacity auctions. These delivered a combined 1.5GW of de-rated capacity, despite capacity clearing prices below 20 £/kW. In contrast, only one new build CCGT project was successful across the first two auctions (Trafford). Construction has not yet started on this project and doubt remains as to whether it can be delivered to meet its capacity obligation at such a low capacity price. Ofgem announced in July that it intends to address what it sees as an unfair advantage to small scale peakers in the form of ‘embedded generation benefits’ that flow to distribution connected assets. The new UK Department of Business, Energy and Industrial Strategy (BEIS) launched a consultation last Friday on a set of adjustments to the Capacity Market rules also aimed at removing unfair advantages to small scale embedded generators (e.g. ‘double payment’ for the Capacity Market Supplier Charge on top of the capacity price). BEIS may also specifically penalise diesel peakers with new emissions limit rules, likely to be announced in advance of the December auction. The outcome of these policy changes may substantially shift the competitive balance in favour of CCGTs. CCGTs have higher capital costs, but also benefit from higher efficiency. This means that they can generate significant additional revenue from the wholesale energy market, on top of capacity payments. However, developers need to find investors or tolling offtakers willing to bear associated market risk. Gas-fired small scale peakers (e.g. reciprocating engines) have a significant capex cost advantage over CCGTs. This helps supports high project leverage and a lower cost of capital. But lower unit efficiency means peakers earn little in the way of energy market revenues. Instead peaker economics are strongly influenced by revenues from embedded generation benefits. What are embedded generation benefits? Distribution connected peakers can service local demand, reducing the system cost burden on electricity suppliers. Suppliers typically pass around 90% of these saved cost benefits back to the generators via Power Purchase Agreement (PPA) contracts. The associated embedded generation benefit revenue streams that generators receive are a key factor underpinning the investment economics of small scale peaking plants. There are several categories of embedded generation benefit revenues that peakers can access. These include avoided transmission (TNUoS) charges, avoided system balancing charges (BSUoS) and avoided capacity market supplier charges (CMSC). If you are interested in the details of these the categories of embedded benefits, they are summarised in Table 1. Avoided TNUoS charges (‘Triad benefit’) TNUoS charges are levied on suppliers based on the load measured in the 3 highest demand periods (or Triad periods). If EG is running in the Triad periods it reduces supplier net demand and TNUoS costs. Suppliers typically passes on ~90% of benefit of avoided TNUOS cost to EG. Typically most lucrative EG benefit (e.g. up to 50% of total). Significant increase in benefit by 2020. Avoided BSUoS charges EG output reduces net demand and hence BSUoS cost burden for supplier. ~90% of this passed through to EG. Avoided CMSC charges Capacity Market costs are recovered via CMSC charges levied on suppliers. As for TNUoS, suppliers can avoid these charges if EG is run to reduce demand. Suppliers pass on this benefit accordingly, although this revenue stream is now under review by BEIS. Other avoided losses & charges EG can help suppliers avoid other losses and charges e.g. distribution network charges (GDUoS) and losses. These typically make up a relatively small portion of EG benefits and are likely to be more stable. The BEIS consultation released last week may result in removal or reduction in revenue associated with CMSC charges. But most important for peaker economics is Ofgem’s key concern relating to the embedded benefit revenues from avoided transmission charges, which National Grid is forecasting will rise substantially by 2020. Revenue gained from transmission charge avoidance is commonly referred to as the ‘triad benefit’. Based on Grid’s forecasts of transmission cost charge increases, the triad benefit may increase by more than 50% by 2020. 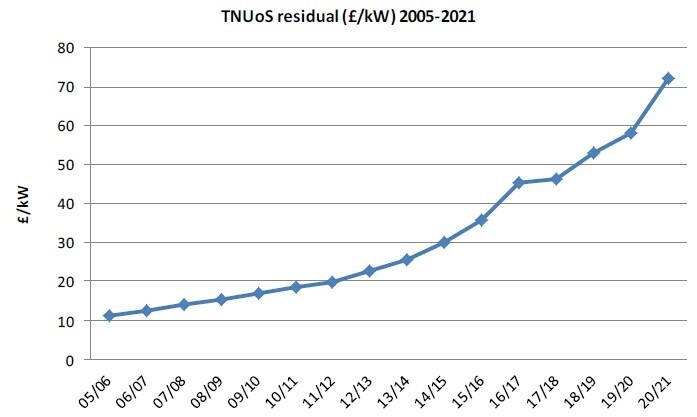 This is driven by Grid’s forecast of a rapid rise in the TNUoS residual charge (the main non-locational element of TNUoS), from 45 £/kW today to 72 £/kW in 2020 as shown in Chart 1. Triad benefit increases represent a key source of projected revenue growth for distribution connected peakers, helping developers to bid projects at competitive levels into the capacity market. An increasing portion of transmission cost burden being pushed onto suppliers, in order to comply with a 2.5 €/MWh EU cap on generator burden. The open letter suggests Ofgem intends to act in some form to constrain (or reduce) the triad benefit available to peakers, prior to this year’s T-4 capacity auction in December. The December capacity auction pitches more than 8GW of new grid connected CCGT projects (and 1 GW of OCGT) against around 6GW of smaller scale distribution connected generators. There is also a ‘wild card’ third category of capacity in the form of 2.4GW of battery storage projects. We suspect that current battery units costs are unlikely to be competitive with thermal capacity yet, but this is something to watch as a future source of capacity. Embedded generation benefits may seem to be an obscure component of the UK power market investment landscape. But the outcome of Ofgem’s review may swing gigawatts of new generation capacity investment in favour of CCGTs. If Ofgem takes a light touch approach to reform of embedded benefits, then peakers may retain their advantage over CCGTs. But larger cuts may spell the end for peakers as a competitive source of new capacity. This is where politics may play an important role. The government has indicated a clear preference for the delivery of large scale grid connected capacity. This is consistent with a strong lobby from the big six utilities and UK IPPs, the dominant developers of new grid connected generation. In contrast, the voice supporting embedded generation benefits is spread across a number of smaller developers and aggregators. Ofgem is expected announce its decision on embedded benefits over the next few weeks. The outcome of this policy announcement, along with the BEIS consultation on capacity market amendments, should provide a clearer view on the rules of play for the Dec auction. Then the results of the auction itself are set to provide an important indication as to whether it will be CCGTs or peakers that dominate the delivery of new capacity next decade.